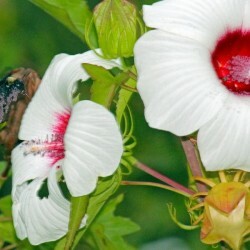 Rose mallow is a Missouri native plant which typically occurs in wet soils along ponds and sloughs, in ditches or in wet woods, sometimes forming large colonies. A vigorous, erect, often woody-based perennial that typically grows 4-6' tall (infrequently larger) and features showy, hollyhock-like, 5-petaled, white or rose flowers (4-6" diameter) with magenta-crimson eyes. Flowers are borne in the upper leaf axils. Each flower has a prominent and showy center staminal column. Perhaps the largest flower of the native Missouri wildflowers. 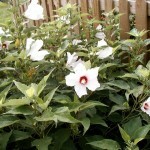 Long, mid-summer to fall bloom period. Ovate, serrate leaves (to 6" long). Leaves, stems and fruit capsules are distinctively hairy (lasiocarpus from Greek meaning hairy-fruited). Landscape uses - Water Plant, Rain Garden, Perennial or mixed border, patio area or courtyard, grouped in moist locations such as along the edge of a pond or stream.